Looking back on the year that was, I realize just how long it’s been since I’ve been active with my blog. With 2017 fully in the rear-view mirror and just a little downtime before the 2018 wedding season heats up, I always like to take time to see what the experts have to say about the season that lies ahead. And who better to turn to than Wedding Wire. For 2018 wedding trends, they expect a shift away from a light and airy feel. In fact, they’re predicting weddings will take on a more dramatic and almost edgy vibe in the form of deeper colors and richer textures. Bohemian and “New Age” styles will replace rustic, and couples will be more relaxed in their approach to planning. So with that said, I’ve listed each of the topics the article discusses with details on just a few I found interesting. 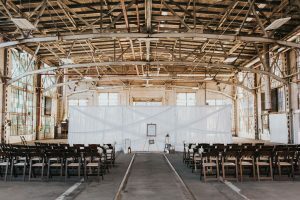 Venues: The Industrial Space – While couples will always love outdoor weddings, indoor venues, industrial spaces in particular, are the new “it” spaces. They have that same relaxed feel and “blank slate” vibe as barn venues (which aren’t going anywhere! ), but with an edgier, hip feel that’s oh-so 2018. And the fact that they’re indoors make coming up with an alternate plan for bad weather a moot point. 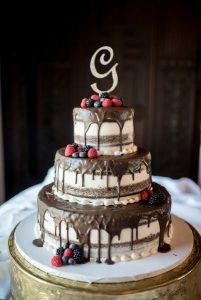 Cakes and Desserts: Drip Cakes and Doughnuts – This is a bit of a holdover from 2017, but they imagine that drip cakes will still be big in 2018 (which I don’t honestly recall seeing in 2017). But don’t worry, the doughnut trend won’t be going anywhere, though couples make take more creative twists on desserts with ice cream, dessert cocktails, and more. Flowers: The Cascading Bouquet – A decade ago, bouquets were petite and sweet. For 2018 wedding trends, the bigger the bouquet, the better. 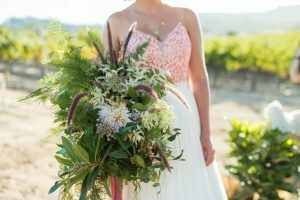 While cascading bouquets may evoke images of Princess Diana’s massive arrangement, Wedding Wire is talking a more modern look here (one thing I can tell you that does NOT change from year-to-year is a DISLIKE of brides and bridesmaids to hold heavy flowers – not sure I agree with this one). Bridesmaid Dresses: Velvet and Pants – Okay, so the bridesmaid dress doesn’t actually have to be a dress anymore?? Bridesmaid pants (both separates and jumpsuits) will be the on-trend ‘maid look’ for 2018?? (we’ll see!). And other trends for bridesmaid dresses include wrap dresses and jewel-toned hues. While I may have focused the details and my comments on those topics I disagree with, I have seen over the years that many of these articles do stay ahead of the trends, so we’ll just have to wait and see. Whether you’re a trendsetter and trend follower or none of the above, make sure to surround your wedding with the details you like. Please share your thoughts on these or any other trends you expect to see in the upcoming wedding season!